Spitfire TZ164, real, replica or maybe a model? During a walk near Woolhampton and Brimpton Airfield on Saturday 19/Sep/2015 I spotted a Spitfire (at least that’s what I think it is) plane in the air. When I tried to look it up on the web I didn’t get very far, apart from that a Spitfire with the registration TZ164 was built in Aldermaston. What I didn’t find though was any information about this plane: Is it the real thing, well restored? Or is it a replica using the registration from the original? Or is possibly even a large scale model plane (although it seemed to be a bit too far from the airfield for that)? If you have any information please leave a note in the comments. Thanks. That’s not a spitfire, vaguely similar wing shape, but that’s about it, not even got retractable landing gear. Landing gear looks a bit lightweight for a full size plane. So he’s just an impostor looking similar and using similar markings? Strange that the only findings I’ve had for this registration are for the Spitfire. I was wondering about the landing gear as well, looked a bit strange. TZ164 was a Spitfire FRXIV that was sold by the Ministry of Supply on 30th December 1953 and that is as car as I can trace its history. 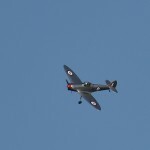 It does not appear on http://www.warbirds.org website and so I believe it must have been scrapped. The photographs that you show are definitely of either a replica or even a model. The engine is all wrong, as is the undercarriage and the cockpit. If I find any other information I’ll let you know. Thanks Sholto, looks like it’s an impostor of some sort then. Just strange I can’t seem to find any other mention of TZ164 (unless I’m searching with the wrong terms). The only thing that makes me think it was a real plane was that it seemed quite big and was a good 3,000 feet away from the airfield where they sometimes fly model planes. It flew right over me and seemed to disappear towards the north. Unless they had some really good FPV gear and distributed spotters I can’t imagine a model would go that far. As posted on Facebook, the aircraft is Isaacs Spitfire reg G-ISAC. 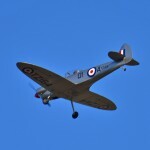 Info courtesy of GINFO section of http://www.CAA.co.UK website using search for Spitfire. Great detective work Sholto, thank you, much appreciated! According to Wikipedia it seems to be a 6/10th size replica. I’ll see if I can find a few more links about this plane and update the post over the next few days. G-ISAC is a privately built 60% of full scale replica Spitfire. Just received authorisation for acrobatic flying. According to the national press this aircraft was built by Alan James a model aircraft fan. I took him 3 yrs to build and cost about £18K, They say it has a RR engine in it, but which RR engine is this small or light. Look more like a 1/2 VW or BMW bike engine with those air cooling bulges. Is it on the LAA or BMAA register ? More about the full size TZ164 from Spitfire: The History. Part of an order for 157 Mk XIV aircraft, placed on 23 February 1945. Recieved by 6MU on 21 August 1945. Passed to 7MU on 28 September. Placed on transport ship Clan MacBrayne 25 November. Returned to 7MU, and passed to British Air Forces of Occupation 18 December 1948 (1949 stated in book is presumably a misprint). Assigned to 2 Squadron 4 January 1949. Declared a non effective airframe on 31 March 1953. The current TZ164 is a new private build by a Reading resident. It is 60% of full size and is now authorised for aerobatic flying. It is the builder’s second home built aircraft, the first one being a Pieton poll Air Camper two seater. There is a half page article, with photographs, of this airframe in today’s Daily Express – Page 11. I’m trying to find out what it is myself, having just seen a large picture of it in this months Pilot magazine. It’s not a real Spitfire by any means, nor is it a replica as such, merely a design of light aircraft that has been modelled on the outline of one. Just trying to find out what though…..
And how irritating is that? As soon as I respond, all the previous comments show up. Doh!! Well, it’s answered it for me too! Cheers guys! 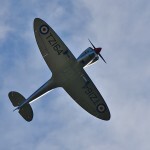 TZ164 is an Isaacs Spitfire made a few years back by a friend of mine who lives in Reading. 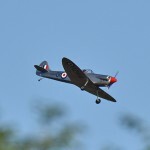 It is a 60% scale size of a real Spitfire and is approved for aerobatics. He got permission from the RAF to use the registration number.